Captain Logan: You are the detectives. Go and detect. Q: What is 'Running Scared' about? Billy Crystal and Gregory Hines are an unlikely, but successful acting pair. They make "Running Scared" an alright movie. Both are funny and play off each other very well. The plot in buddy-cop movies is almost always the same, its the actors that make a difference in this genre of film. 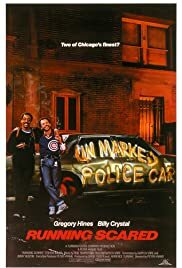 "Running Scared" works because the two lead actors give great comedic performances. Oh, and if you're ever feeling nostalgic for the '80s, watch this movie!